TYCOON has exemplified the excellence in craftsmanship throughout the years that has resulted in the internationally known TYCOON CUT diamond. 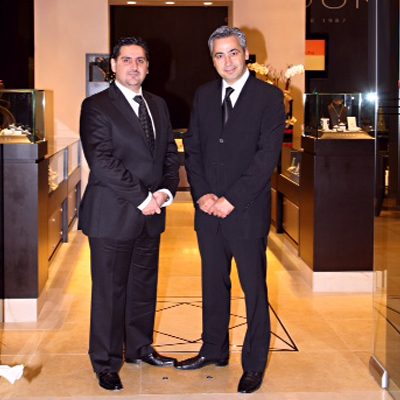 The Kejejian cousins are Lebanese born with Armenian descent came to the United States 30 years ago with a dream and passion to carry on the family name that has mentored and produced three generations of superior craftsmen in the jewelry industry. With a drive to establish their own company, they worked for some of the most respected designers in the industry. Their creativity, talent, honesty and integrity built their reputation amongst their peers and gained recognition. Their jewelry designs are innovating and unparallel. The most challenging design project was the TYCOON CUT diamond, which made its grand entrance to the diamond industry in March 2000, at the American Gem Society Conclave in Philadelphia. Today, TYCOON holds four U.S. patents for its designs, one being the TYCOON CUT diamond that has been recognized by the Gemological Institute of America (GIA). It is truly a masterpiece of modern gemology. With its nine crown facets that give it significantly more brilliance and its signature diamond shaped table that sets it apart, it is known in the industry as "The only diamond with a diamond on top." TYCOON is recognized in the industry and are member of the Jewelers 24K Club, GIA Donor & League of Honor member, AGS supplier, AJA, & JBT member. The TYCOON CUT diamond...a diamond that refines and transforms tradition. See the difference!